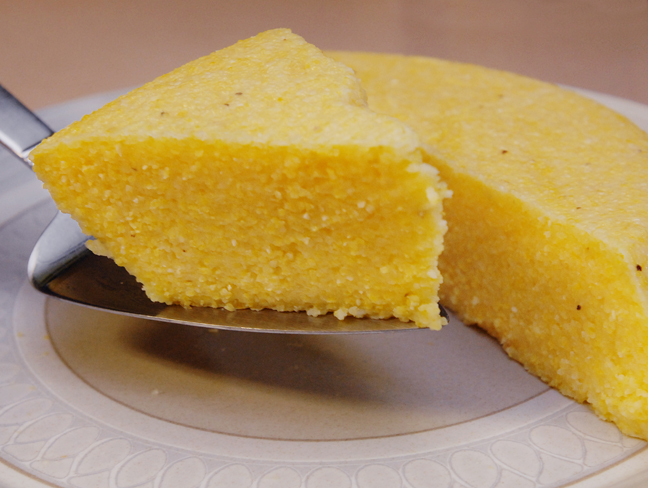 If corn bread and grits married this would be the tasty result of that union. The greatest thing about polenta is how versatile it is as a leftover. Grill it, bake it covered in sauce and cheese, pan fry it and top with an egg, or eat it sliced cold or warm. These are just a few of the options leftover polenta can provide for additional meals. It keeps in the fridge for at least a week and really only takes a short time to make. The only problem is finding the polenta grain itself. Most grocery stores offer a cooked option or two packed in a tube in the ethnic food isle. Nasty and overpriced are kind descriptions. A trip to the health food store (the one with all the weird grains, beans and flours in bulk bins) is your best bet for the grain by itself. Usually it will be named coarse corn grits, yellow corn grits or polenta flour. Do not confuse it for true grits which is ground finer and usually white or corn meal which is ground to true flour. They will keep in an airtight container indefinitely like any other grain. The recipe is simple but does give your arm a workout. I like using a pie plate but any container around 9” will work to set the polenta. It can also be poured into molds to create shapes etc. In a 4 quart pan bring the chicken stock and water to a boil. Take a 9” pie pan and fill with water. Add salt and turn down to a simmer. Add polenta in a slow steady stream while whisking continuously. Whisk till smooth then switch to a wooden spoon and stir non stop till polenta pulls away from the sides of the pan, at least 10 minutes. If polenta thickens to quickly add ¼ cup water. Once thickened add cheese and stir till fully mixed. Quickly dump water from pie pan making sure to get all the sides wet. Pour polenta into pan and smooth out top till even in pan. Allow to cool for 10 minutes. Place a plate over the top and invert pan. Polenta should slide out onto plate in an exact mold of the pan. Let it set at least 30 minutes before serving. This entry was posted in Food, Recipes, Sides and tagged grain, healthy, italian. Bookmark the permalink. Love it. I fry my leftover polenta in olive oil. Yours look so good. Have you ever tried the quick cook version? Just wondering. I used “Bob’s Red Mill” Medium Ground Corn Meal (with no problems) and added about 1.5 C of fresh peas along with the cheese. 1 million times better than the yellow tube stuff. But I have to ask, is there REALLY any problem with just using plain ol’ grits? Ha, I haven’t done that. But I will say the grits I use aren’t nearly as fine. I love good grits thought. Fresh peas sound wonderful. Glad there were no problems. This is my favourite way to make polenta ! I absolutely love the stuff. Perfect timing. A bag of polenta has been calling out for attention. Thanks for posting this recipe. Oh thanks for posting – I’m itching to try my hand at making polenta with some fresh ground that is sold at the Spice Shop where I work!